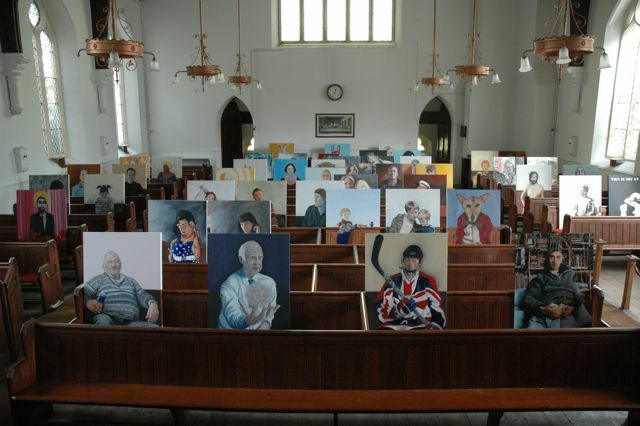 The first collaboration between shardcore and Sam Hewitt occurred in 2008 when they invited artists to contribute life-sized portraits to be seated in the pews of a local church, the show was called MASS and contained work by over thirty artists including themselves. Over the next two years the show developed, was re-branded as Congregation and moved to St Paul’s church in the centre of Brighton. It served as a vehicle for discussions through painting and performance about the sacred and profane. As a result, in 2009 they were commissioned to create the centrepiece for the White Night Festival in Brighton’s Jubilee Square. The work involved two giant robotic replica Fortune Cats, a congregation of robed worshippers and a hidden team of voice actors and comedians. They created a database of resonant slices of poetry, wisdom, philosophy and advertising and classified them according to which aspects of the human condition they might relate to. This database was then used by the voice actors to classify and answer questions from the crowd via the giant cat statues. The Cats had the aura of gods. Individuals chose a Cat, approached on a red carpet and asked their question on a gold telephone. The questions were often serious and heartfelt and the team in the hidden booth were very excited and resourceful about giving good answers. Conversations and games developed between the Cats, the worshippers and the crowd. In 2010 the show was translated into French and taken to Nuit Blanche in Amiens. It was equally successful but contained more flirting between the Cats and the Crowd. Fortunecat Productions was born and for their next trick, for White Night 2010 they built an installation in the warren of rooms beneath The Latest Bar in central Brighton entitled The Enlightenment Machine. A combination of staging and video work set the scene for a generative piece involving content from enlightened and not-so-enlightened speakers. In 2011 They developed this idea and presented The Consciousness Engine as part of the HOUSE Festival at The Old Market in Hove. This was intended as a representation of humanity’s relationship to consciousness. It was a series of rooms: Miss the Party – videos of conversations, garbled enthusiasm about the power of the Self, viewed through a gun sight in a locked party. God’s office – with a golden phone, the number of which was distributed on flyers which simply said Talk To God. The rage space with staging and video works. Finally the Engine Room where a generative work used a synthetic voice to read from writings about states of consciousness over it’s choice from a database of first-person video. For White Night that year The Fortune Cats, as the collaboration was now called, staged a participation event called Who’s Afraid of the Big Society? Visitors were interviewed one by one, answering the same series of questions about society. This was filmed and fed live into a basement containing an audience who had already been through the interview. Overlaid on the feed was a system of classification which altered in response to the answers. At the end of each interview, people were put into one of six categories and offered suitable ways to contribute to the Big Society. They then joined the audience downstairs, with a revelation they had been watched, often to great applause. In 2012 the Fortune Cats received Arts Council R+D funding for The Conscious Machine. Version 3.1 was installed in The Basement for the Brighton Digital Festival as work in progress. After viewing a short film about the rise of Artificial Intelligence, visitors are taken to the Machine. They watch a screen showing a live internet search geared to emotional states, results are presented as poetry and read by a synthetic voice. This is interrupted when someone sits in the antiquated dentist chair in the centre of the room. They are taken through a breath relaxation technique and shown generative first-person video whilst the synthetic voice discusses emotional awareness. Their breathing is monitored discreetly and used as a controller for the contrast and saturation of the video feed.